Unprecedented and transformational changes are needed to prevent dangerous climate change. Over the past decade, climate mitigation philanthropy has focused on seizing the best near-term opportunities to reduce clean technology costs, lock-in greenhouse gas emissions reductions, and protect key carbon sinks, mindful of what is required through 2030 to meet a well-below 2°C goal. 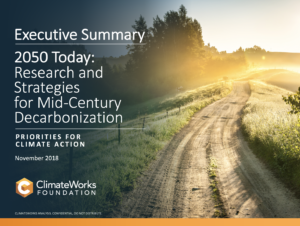 2050 Today—an initiative of the ClimateWorks Foundation—examines what needs to happen today to decarbonize the global economy by mid-century and avoid the worst impacts of climate change. In 2017, the ClimateWorks Foundation began an internal analysis of 2050 carbon reduction goals needed to achieve a well-below 2°C pathway. We selected five approaches critical to meeting those goals to explore more deeply. In June, 2018, we convened more than 100 experts from research, philanthropy, academia, industry, and public office to help test our initial conclusions and approaches. With these experts from the US, China, India, Europe, and Latin America we explored cross-sector topics to generate a shared understanding of how, together, we can accelerate progress toward achieving net-zero emissions by mid-century. 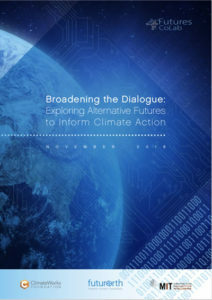 During the summer of 2018 ClimateWorks teamed with Futures CoLab, a partnership of FutureEarth and the MIT Center for Collective Intelligence, to conduct a facilitated scenario development exercise using an online platform. More than 150 people from 38 countries participated, contributing perspectives from academia, civil society, business, think tanks, and government. This report summarizes the findings of the exercise. Electrification is essential. While some applications are ready to scale, many need development and others could remain impossible to electrify and require low-carbon alternatives. Rapid decarbonization requires philanthropy to invest in strategies that generate spillover effects and lead to tipping points. From today through 2050, the basic economic, social, and political drivers underpinning global emissions will experience profound shifts of their own. The math is clear—meeting Paris Agreement temperature goals will require not just reducing emissions but also removing them from the atmosphere.